Dazzling, daring dragonflies are seen darting about at all hours of the day. Twenty years ago they appeared in great numbers in late afternoon, gracefully hovering in a dance above the meadow. This year they have appeared in a stunning array of brilliant colors by mid-morning. 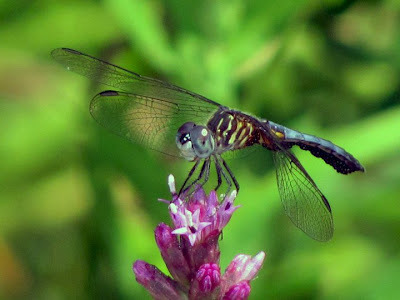 Dragonflies are located worldwide and have more than 5,000 described species, 450 of which reside in North America, with Texas alone home to 225 species. Considerably downsized now, a fossilized dragonfly from 250 million years ago had a wingspan of 28 inches! Dragonfly adults are lovely and graceful, with a sweet head that turns to look at you quizzically with magical eyes. Often brightly colored they have two pair of long, slender, transparent, translucent, and highly veined wings. The wings do not fold but are held permanently outstretched even when at rest. Adult dragonflies are usually found near water with a territory which may range several miles. Many males are intensely protective, defending their domain from other males, which may include sudden aeronautical chases which exhibit extraordinary maneuverability. A truly beneficial insect, from infancy to maturity, dragonflies eat mosquitoes. The immature dragonfly is called a nymphs (or naiads). Nymphs are entirely aquatic and are found on submerged vegetation and the bottom of ponds and marshes where they capture and eat mosquito larvae. The adults seen above the meadows are capturing adult mosquitoes while in flight. Regardless of their artistic and intrinsic importance, the fact they will purge the garden of mosquitoes make them an extremely welcome visitor anytime.